Looks like he is giving us a sly, sideways look. 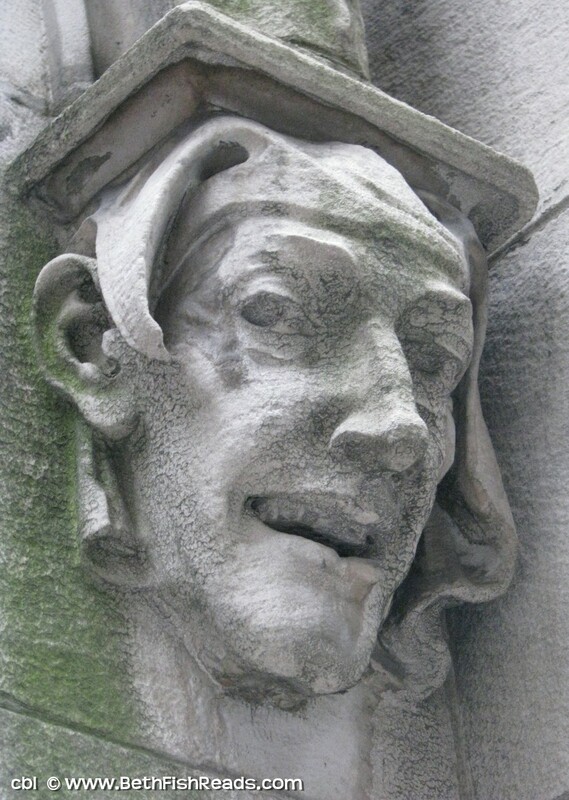 It looks like a graduate who has been immortalized in stone. Great photo. The expression says it all. Haha a little bit creepy a little bit historic. I like! I love it - it almost looks like a painting. I wonder if that was based on someone the sculptor actually knew, if it had a story behind it? What a great shot of a fascinating and unexpected subject! Aren't all New Yorkers happy? Great shot! What building did you find him on? He looks mischievous. It was in Manhattan -- in the east 50s?? Maybe near 5th?? Had to stop to take his photo. I am drawn to these little guys perched on the side of buildings. You will see some whenever I start posting my pictures from Poland! Is that a jester? With the look that he is giving, and the bit of scrap coming down over his eye, it looks like he might be! It looks kind of creepy - you know like one of those goblins maybe- but awesome as well. Great photo! Cool and kind of creepy at the same time. Great picture, but I'm not sure if I actually like him. Great shot. Very eerie but sort of funny kind of expression on the face, like he's laughing at something that might not be all that nice! I agree with some of the others who left comments...creepy, but cool, but mostly creepy. Okay, yes absolutely, cool too. He's looking right at us, with that angle you captured!